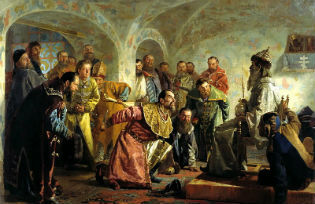 “Oprichniki” – painting by Nikolai Nevrev. Owning a business in Russia today is a hazardous affair: each year thousands of companies close after their owners are accused of ‘economic crimes’ and face either prison or protection payments to government officials. Owning a business in Russia today is a hazardous affair: each year thousands of companies close after their owners are accused of ‘economic crimes’ and face either prison or protection payments to government officials. Andrey Zaostrovtsev describes a system reminiscent of an equally lawless period in Russia’s past. Writing in 2011, The former judge Sergei Pashin characterised today’s Russian economy as ‘an Oprichnik mode of production’. The Oprichniki, Ivan the Terrible’s (1530-1584) personal bodyguards, bring up a horrifying image in the Russian consciousness. Subject to the Tsar alone, the Oprichniki obeyed no laws, and in the course of their criminal activities they were known to lay waste to whole regions of Russia. But what exactly did Pashin mean by his phrase, and laws are actually operating in Russia’s economy today? Clearly, Putin’s attempts to build ‘power vertical’ has culminated in a fully formed authoritarian regime. This has been recognised by all international classifications. The Freedom House organisation, for example, in its annual Nations in Transit report has since 2008 described Russia as a ‘consolidated authoritarian regime’. The country was also categorised for the first time as an authoritarian regime by the Economist’s Intelligence Unit in its 2011 Democracy Index. Yet international ratings and general definitions of authoritarian regimes are an inadequate guide to the specific characteristics of Russian society as it has evolved in the first decade of the 21st century. In fact, it is a society made up of various socio-economic classes, each with its own rights, and privileges, including the right to dispose of economic assets. It is not a society of equal citizens: it is a society of elites. Putin is the Tsar of the bureaucracy. He guarantees its privileges; it provides him with support for his rule and a channel for his will. The Russian bureaucracy is however too large and too heterogeneous. It is divided into a number of social groups, some with a greater, and some with a lesser degree of power. But it is always less a question of official prerogatives than of informal opportunities for using legal rights for illegal purposes. Naturally, the people with the greatest opportunities are the so-called ‘Siloviki’, literally, the ‘men of force’ – powerful members of Putin’s circle, many of whom have, like Putin himself, a background in the security services. The Siloviki are known for using their official coercive rights for their own personal ends, and get rich thanks to illicit ‘taxation’ of business and the transfer of property and assets to ‘crony firms’. Russia is a predatory state, dedicated to screwing private business. The Silovik bureaucracy, which includes not just the FSB, MVD (Interior Ministry), Federal Public Prosecutor’s Department, Investigative Committee and State Drugs Control Agency, but also the courts, the FSIN (Federal Service for Execution of Punishment, which controls prisons) and the tax authorities, is constantly engaged in this. And it is very unlikely that there is a single owner of a private company who has not been the object of the Silovik protection racket. ‘The Siloviki are known for using their official coercive rights for their own personal ends, and get rich thanks to illicit ‘taxation’ of business and the transfer of property and assets to ‘crony firms’. This model of relations between government and business has its roots in the fact that Russia has exchanged one kind of lawlessness for another. Organs of repression are always happy to carry out any political directive from the ruling clique in exchange for a licence to appropriate people’s money and other assets. And a mechanism for doing this is furnished by the legal and official powers granted to them by the state. The Siloviki have a wide variety of means at their disposal to part business owners from their income and assets, but they all have something in common. Everything starts with a false criminal charge based on one of the so-called Economic Articles of the Criminal Code. The alleged offender is then presented with three options: he or she can buy a way out for a substantial sum, make regular payments to a nominated middleman or sell their business at a knockdown price to a company with informal links to the Siloviki. The victim often receives a prison sentence for their alleged crime, which simplifies the appropriation of their business immensely. He or she may also pay for a lighter penalty, a suspended sentence for example. But any business owner who actively resists this process is certain to end up behind bars. In fact, some people convicted of economic crimes get longer sentences than murderers. The report notes that such consolidated repression of a specific group of Russian business owners was last practised by the Soviet government in the late1920s and early 1930s, the time of collectivization (when the victims were the Kulaks, the richer peasants) and the end of the liberal ‘New Economic Policy’ initiated by Lenin in the early 1920s to kick start the Soviet economy. Today history is repeating itself, not (as Marx would have it) as farce, but as a new tragedy. I think we have to assume that it is the last option that is the most common. Of course it is a very good thing that so few cases come to court and end in conviction. The point frequently made in these studies, however, is that the very fact of a case being opened usually means that the company in question can no longer continue its commercial activity and will eventually fail. And terrible human tragedies often lurk behind these dry phrases. The‘Criminal Politics in the Economic Sphere’ report records the fact that between 2006 and 2010 the number of companies that ceased trading increased year by year, and in 2010 made up over 80% of the total number of registered businesses. Seventeen percent of business owners are seriously considering emigrating in the next five years, giving as their main reason the vulnerability of private property and general lack of protection from the law, as well as fear of arrest and officials’ abuse of their power. What conclusions can we draw? Simply, that a disregard for citizens’legal rights in Russia’s economic life has led to the disappearance each year of companies collectively contributing an average of 1.82% to Russia’s GDP (in other words, an overall 12.75% in the years 2004-2010). Or to put it another way, the best means of insuring an increase in the country’s growth rate would be to get rid of the Siloviki. This, however, is more easily said than done: an Oprichnik has taken over the Russian economy and has no intention of handing it back.